Queen Anne’s lace really stands out in a crowd when it’s in bloom. The big umbrella-shaped white flowers are hard to miss. But when fall comes, the plant closes up shop. 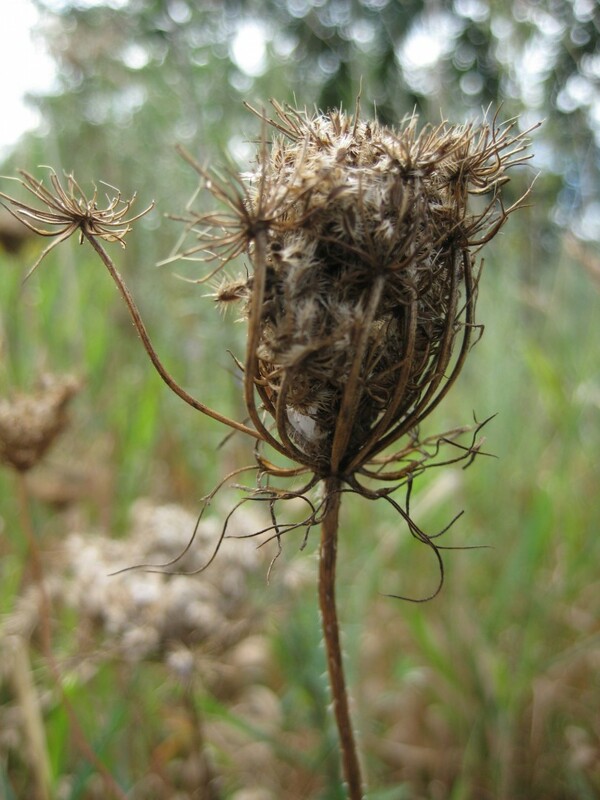 The round flower head clenches itself up like a fist and forms a tight brown clump sometimes known as a “bird’s-nest.” It’s not a nest for birds, it’s more of a restaurant, since the birds come and check out the clumps for insects and spiders that might be hiding inside. Then, the amazing part–the Queen Anne’s lace flower, apparently dead, stiff and dried-up, re-opens. It stretches out, bit by bit, like the fingers of a hand opening wide. Inside the clump are the seeds, now fully ripe. Each seed is edged with sharp bristles that latch on to every passing bird or mammal, spreading the seeds far and wide.